Is corporate #mobile App development too expensive? The other day, a fellow Enterprise Architect was lamenting on how the sticker price of “mobile enabling” applications was giving pause to business stakeholders. The business partners who were queuing up with proposals for mobile enabling applications in the portfolio were assuming this capability would automatically move forward along with regular upgrade and maintenance cycle. When presented with the cost of enabling applications for smartphones and tablets – ability to download from app store, running natively on multiple devices, form factors, securely connecting and integrating data with the corporate back end – most users were stumped. The argument from business stakeholders is understandable: if Apple store can boast of 1.2 million apps, and there are similar number in the android, Amazon and Microsoft ecosystems why can’t my corporate IS push a few hundred of our applications to myCorp-App store? 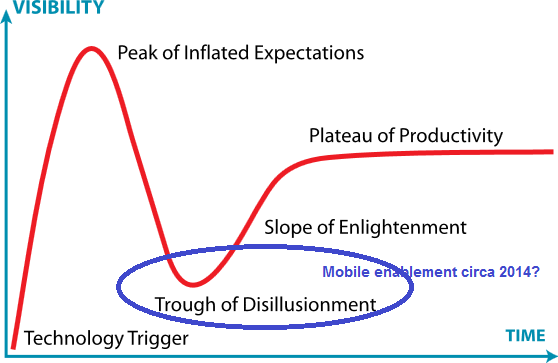 The good news is that we are already at a “trough of disillusionment” (apologies Gartner) when it comes to mobile enabling corporate applications. In a sense, corporate IT is already climbing the “slope of enlightenment,” especially since most new products are already being designed with mobile usability right out of the door. And for new application development, mobile enabling is not an icing on top but an integral part of the design. Pockets of business stakeholders are also coming to grips with this slope of enlightenment and are willing to pony up the costs, especially when it comes to enabling applications required by mobile workforce – for consultants on the road, sales reps and also applications that enable field workers like UPS drivers, gate agents walking around busy airport checkin areas among others. In many cases, where cost is a constraint, business users are accepting simpler options, say redesigning websites to be html5 compliant, that would work on “most” devices and form-factors, not necessarily with “all” the bells and whistles of an app from an apple store. If a picture is worth a thousand words, as the beaten adage goes, the use of big data, creative analytics and graphics is certainly worth much more. 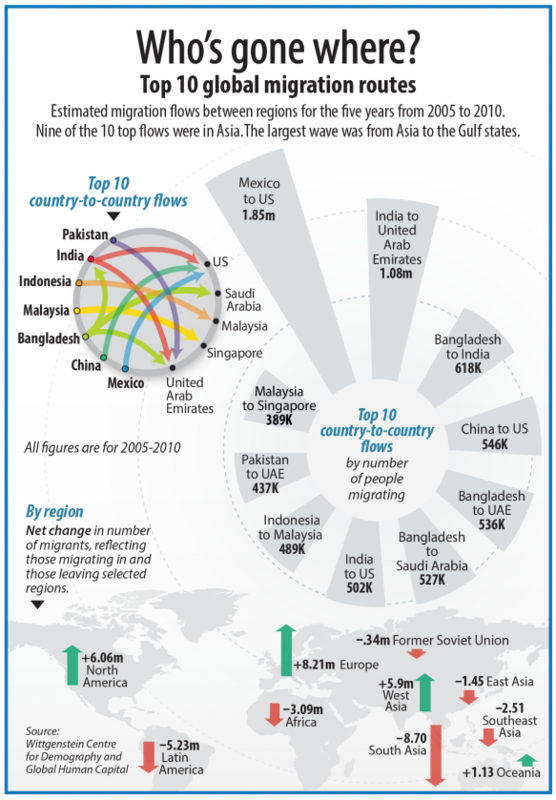 Here is a great example of using Big Bata to explain migration from The Economist. As with most pictures, what is depicted here is only a small slice of the big frame, the angle the author/analyst wanted to highlight. I like this picture for the story that it is trying to tell different audiences in a visually appealing way. A picture like this is sure to resonate with policy makers, corporate executives and even hiring managers and recruiters. If not anything else, it raises questions and follow-up actions from the information depicted. As is obvious, the recipe or its variances for data analytics are not easy to follow. For one, there is a challenge of defining a problem statement. And then there is the science of gathering data, developing the engine to run the analytics. Then comes the art of visualization while presenting the information. As one might argue, there is a secret sauce missing in the recipe above! 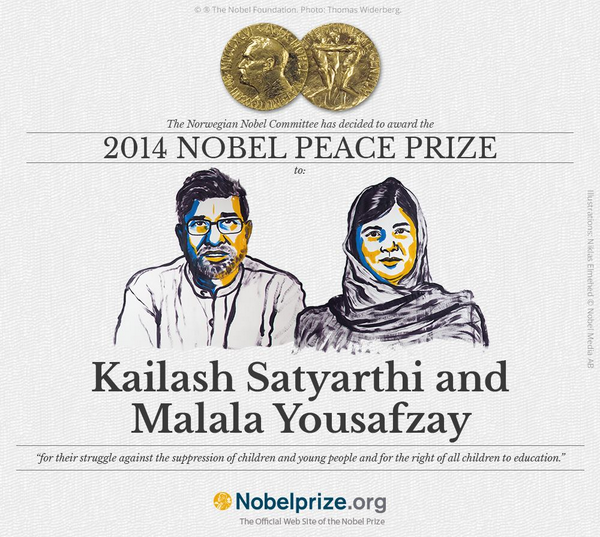 It is heartening to see the Nobel Peace prize for 2014 go to two South Asians, Indian children’s rights activist Kailash Satyarthi and Malala Yousafzai, a Pakistani teenager shot by the Taliban after campaigning for girls’ education. I’ll admit, like most others living in the west would do, that Malala Yousafzai is a well known name but Kailash Satyarthi, who? I am sure this is about to change with the announcement since most of us will not only become aware of Mr Satyarthi but also about the cause for which he stands. Having just finished reading Malcolm Gladwell’s bestseller (my #amzaonreview), I was reflecting on Malala Yousafzai and her branding as the unlikely role of David she has been thrust upon to go against the Goliaths (Taliban) in Middle East and South Asia. One can argue that in the fight against the bad guys, the Goliaths and Taliban, one has to win over the hearts of the public. A teenage girl, part of the underdog strata in the society that still oppresses women, who goes against the bad bully, Taliban is just the kind of hero one needs to win the hearts and minds of junta (public). And by awarding a Nobel Peace prize to the teenage hero, we are doing just that: reinforce the will of Davids’ to stand up to the Goliaths! It is interesting to read the announcement on the split of yet another tech giant, Hewlett-Packard, coming shortly after the breakup of eBay and Paypal. 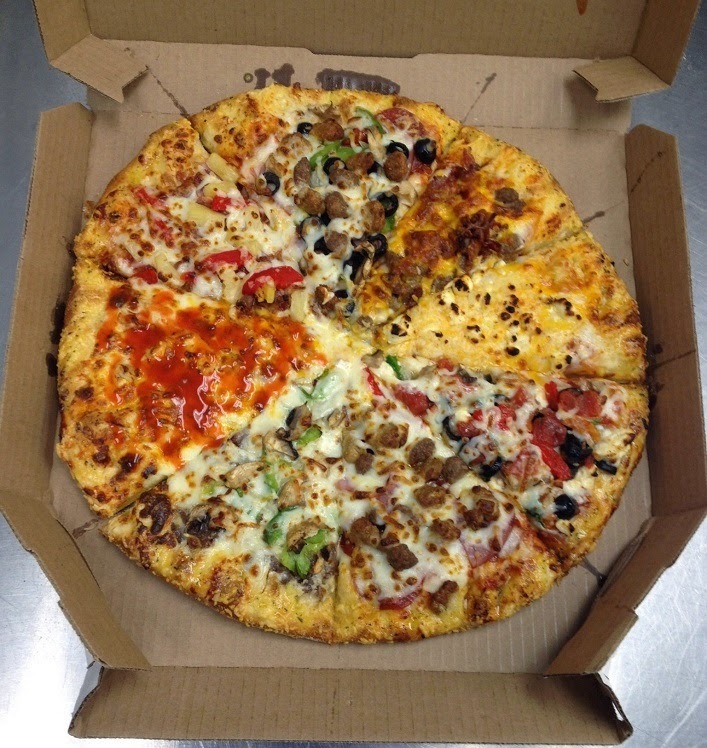 Every time I read announcements on mergers and de-mergers, the image of a large pizza with different toppings on each slice comes to mind. The impact on people, employees and stakeholders including customers, who are left to manage the change - management speak for those left catching the falling knife – from such de-mergers, has been studied ad infinitum. And so has the impact on the groups of people who benefit from mergers and demergers: shareholders and investors, lawyers and consultants. The footnote in the analysis of Hewlett-Packard’s Value enhancing move “Planned job cuts will increase to 55,000 and costs to restructure cost will be about $600 million.” made me wonder: $600 million to slice a corporate pizza? !